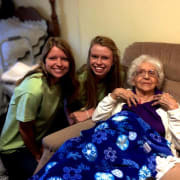 Volunteers provide companionship and support to hospice patients and their families. While visiting with their patients, volunteers might read, play board games, talk, sing, or simply share stories - the options are endless. You decide how much time you can give a month; we will match your interests and schedule. We work all over Northeast Ohio, going to our patient calls home (private house/apartment, nursing home, assisted living facility). We strive to keep our volunteers within a 15 minute drive from the patient(s) they visit - so you can volunteer right in your local community!